[New York, NY – May 31, 2018] Today, Grammy, Golden Globe and Emmy Award winning recording artist, actor and producer Childish Gambino’s “This is America” was certified platinum by the RIAA. The song has enjoyed multiple #1s since its cultural takeover with its release May 7th during his stint hosting and performing on “Saturday Night Live.” The track debuted at #1 on the Billboard Hot 100 chart with his poignant song and captivating video, “This Is America,” according to Nielsen SoundScan and held the top spot two weeks in a row. Internationally, the track debuted on Spotify’s Global Chart and US Chart and reached #1 on iTunes in 45 markets (Top 5 in 63 markets). In addition, the track continues to hold the #1 spot on the Overall Streaming Chart three weeks in a row, held the #1 spot on the Song Consumption Chart (two weeks in a row), #1 on the Digital Songs Chart (two weeks in a row), and #1 on the Audio On-Demand Chart (two weeks in a row). 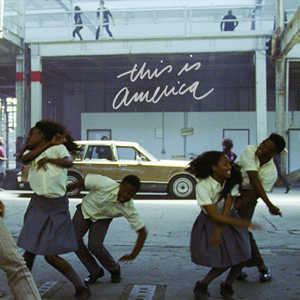 The Hiro Murai-directed video for “This Is America” has garnered over 216 million views since its release and is currently #1 on YouTube’s U.S. Top Music Videos and U.S. Top Songs, holding strong in that position for three straight weeks since release. The video earned 85.3 million views in its first week on YouTube, making it the biggest first week debut of any video this year and #1 on the YouTube Songs chart in 11 countries including the United States, the United Kingdom, Australia, and more. The video for “This is America” is also tied for the 5th fastest music video to reach 100M views in YouTube history, reaching the mark in under 9 days. *”This Is America” is not the first official single from Childish Gambino’s forthcoming debut album on Wolf + Rothstein/RCA Records.